Supper #1: Caraway Cabbage was an easy, tasty, wintry side dish. 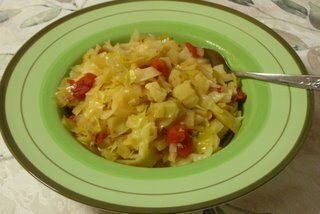 Supper #2: After cooking for another 90 minutes, Caraway Cabbage transformed into something akin to noodles, a low-carb, high-fiber substitute for pasta, rice or potatoes. Lunch #3 Warmed in some cream-ish broth, Caraway Cabbage became a bone-warming soup. The recipe? It's in a 2004 Kitchen Parade column. FOR THE RECORD ... This is A Veggie Venture's contribution to ARF Tuesdays over at Sweetnicks, the weekly inspiration to cook 'n' eat up antioxidant-rich foods. I don't know why I don't cook cabbage more often. Whenever I've had it, I've loved it and now that I think about it, I'm really partial to red cabbage. Yours looks delicious though and I love that you turned it into three different dishes. I agree with Karina - you can't really go wrong with cabbage (or sauerkraut) and caraway!